Less time, more work, how to do that? Cisco IP Phone 8800 series may help you feel flexible and work with ease. As the next generation Voice Communications, the Cisco IP Phone 8800 Series delivers ease of use with superior performance. Cisco IP Phone 8800 Series includes five models to support a wide variety of users: the IP Phone 8811, 8841, 8851, and 8861 models and the IP Conference Phone 8831. 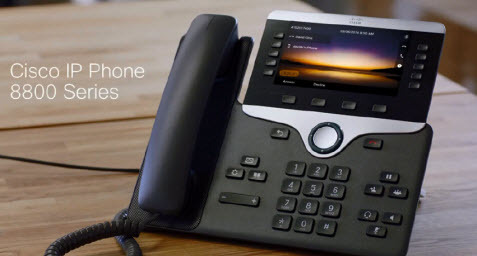 With the Cisco IP Phone 8800 Series, it all begins with voice communications. The IP Phone 8800 Series are the best audio performing IP phones Cisco has delivered. Wideband (G.722) audio is supported on all five models and the 8811, 8841, 8851, and 8861 models are hardware-enhanced for higher performance on echo cancellation, meeting European Telecommunications Standards Institute (ETSI) compliance. In addition, vibration isolation of the hardware has been applied to both speakers and microphones, resulting in a higher-quality communications experience. Although not a feature of Intelligent Proximity because the IP Phone 8851 and 8861 models offer USB support, you can even charge your personal mobile devices from the USB ports on these phones as an added convenience. Select models of the Cisco IP Phone 8800 Series support multiple-call-per-line appearance. With multiple-call-per-line appearance, you can take advantage of more sophisticated call-navigation capabilities with support for multiple call sessions on a per-line basis. For example, you can be on an active call and navigate to pick up a second incoming call on the same line, while the first call is automatically placed on hold. You can then switch back and forth between these two call sessions, as required. This capability offers your organization sophisticated and powerful communication options that are not typically available from other communication systems. Fixed keys for commonly used functions including messaging, directory, services, transfer, conference, mute, headset, speakerphone, hold, and release. Support for 802.3af/at Power over Ethernet (PoE) to reduce installation and infrastructure costs by eliminating or reducing the need for local power supplies. Gigabit Ethernet integrated switches on all models to reduce IT administration and cabling costs at the desk while efficiently and effectively processing the traffic from a collocated multimedia PC. Integrated VPN client to help keep conversations private. Reduced energy costs and carbon footprint in off-work hours with support from Cisco EnergyWise technology. The Cisco IP Phone 8811 delivers highly secure and powerful mission-critical voice communications that are easy-to-use and are ideal for knowledge workers and teleworkers in midsize to large enterprises. With its support of Cisco EnergyWise technology, the 8811 is a Class 2 Power over Ethernet device so it is both cost-effective and Earth-friendly. Unique to the Cisco IP Phone 8811 is a 5-inch, backlit, graphical, grayscale widescreen VGA display (800 x 480 pixels). 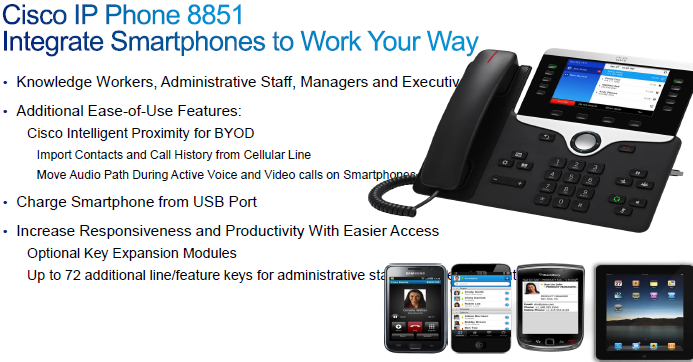 The Cisco IP Conference Phone 8831 facilitates a more productive in-room and executive office conferencing experience. Superior high-definition (HD) audio performance: The full-duplex wideband (G.722), dual-element hands-free speaker helps improve productivity for mission-critical communications. Enhanced Room Coverage: You can “tether”, or daisy-chain together, up to a maximum of two base units, for greater 360-degree coverage for small to large conference rooms and executive offices. Real-world convenience: The phone has a wired control panel with dial pad, enabling flexible support in meetings with more than one chairperson — even when they are seated apart from each other. Users simply rotate the control unit toward the chairperson for quick, convenient access. Room deployment flexibility: With support for Digital Equipment Cordless Technology (DECT), optional wireless extension microphones and wireless microphone charging stations can now be deployed. Wireless microphones are useful in larger conference rooms and executive offices where microphones can be easily relocated to accommodate multiple participants. There is also optional support from wired extension microphones for non-DECT environments. The wired control panel houses the LCD display, which is a 3.25-inch, backlit, grayscale, 396- x 162-pixel display. As with the other endpoints in the IP Phone 8800 Series, the IP Phone 8831 secures communications with its support of AES 128-bit encryption on the device. The Cisco IP Phone 8841 delivers superior voice communications that can enhance collaboration throughout your entire organization. It is ideally suited for knowledge workers, administrative staff, and managers in midsize to large businesses. The IP Phone 8841 comes standard with a 5-inch color, backlit, graphical widescreen VGA (800 x 480 pixels) display. As a Power over Ethernet Class 2 device, it is both cost-effective and Earth-friendly. 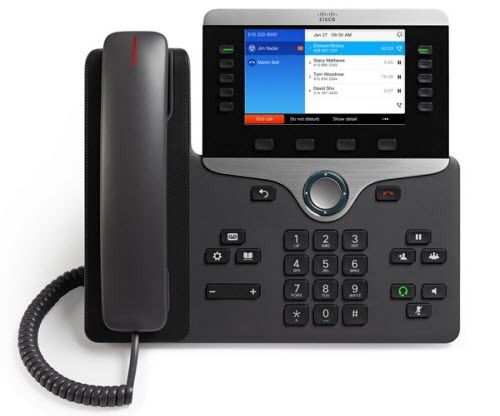 With the Cisco IP Phone 8851 or 8861, you can delight your users with an experience that offers superior voice communications from an IP Phone while integrating telephony features with their personal smartphone or tablet1 (Cisco IP Phone 8851) and tablet3 (Cisco IP Phone 8861), when in range of the 8851 at the desk using Cisco Intelligent Proximity for Mobile Voice. As an added convenience, the IP Phone 8861 can charge both personal smartphones and tablets from its standard USB port4. Finally, for headquarters or branch offices whose campuses are fully wireless-enabled, the IP Phone 8861 supports 802.11n and 802.11ac protocols to add flexibility and reduce costs in such campus environments. For administrative staff, managers, executives, and help desks in retail or work areas with shift workers in healthcare, the addition of optional Cisco IP Key Expansion Modules for IP Phone 8851 and 8861 models can enhance your experiences with added convenience, while extending your initial return on investment in the IP phone. These modules, specific to the IP Phone 8800 Series, enable you to take advantage of additional programmable, customizable line and feature keys. Capabilities such as speed dials for “single button push to contact” and shared lines (where administrative staff can pick up calls for managers who may be on the phone or departmental colleagues who may be away from their desk) are examples of use cases. Module has 18 physical keys and offers two page keys for a total of 36 keys per module. Up to two modules can be supported from the IP Phone 8851, resulting in an addition of 72 keys to the 5 that come standard with the 8851 phone. Up to three modules can be supported from the IP Phone 8861, resulting in an addition of 108 keys to the 5 that come standard with the 8861 phone. The display is 4.3 inches, with a backlit, graphical color display (480 x 272 pixels). The font size has two configurable options to address preferences in viewing of key labels. The IP Key Expansion Module for IP Phone 8800 Series was available H2CY14.